Attention people, there’s big news out of Washington: Paul Ryan, the Republican speaker of the House, has announced that he has an idea! This is news because the GOP leadership hasn’t offered a new idea in years. Instead, they’ve simply been the party of no, opposing all proposals put forward by Democrats and nixing everything that big majorities of Americans want Congress to act on — like a jobs program to repair our collapsing infrastructure and a raise in the minimum wage to above the poverty level. So some were excited when Speaker Ryan called a major press conference to present his idea for fixing the economy. Image via Tony Alter @ Flickr. It’s a rehash of the same old stale “idea” the GOP has for every issue: Eliminate government protections for consumers, workers, our environment, and so forth, so corporate profiteers can run roughshod over us. That’s the sole idea in the highly hyped, 57-page “economic agenda” that Ryan is peddling like a snake oil salesman. His “fix” is to roll back hundreds of important regulations that restrain corporate rapaciousness. For example, he wants to free Wall Street bankers, for-profit colleges, cable giants, and others from rules that prevent them from ripping off and otherwise harming consumers. A provision in the plan also repeals “all climate change regulations under the Clean Air Act” — a sweet favor for Big Coal and electric utility companies. 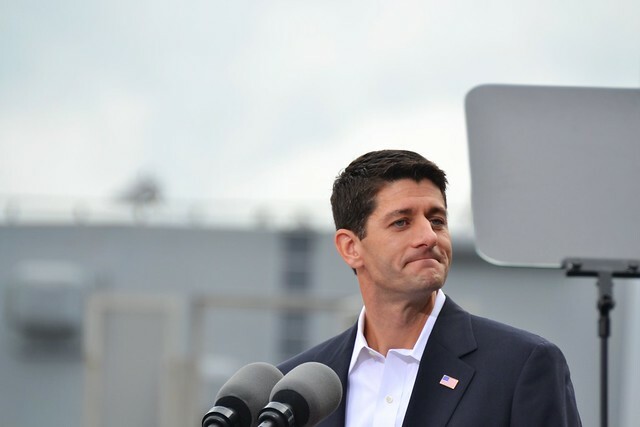 Ryan would even cancel ethics rules that require retirement advisers to act in their client’s best interests, rather than taking kickbacks for persuading clients to put their savings in bad investments. By calling these rank corporate giveaways an “economic agenda,” Ryan himself is committing a shameful, immoral fraud against the American people. His plan would “fix” our economy in the same way a veterinarian fixes your dog.